Woohoo! 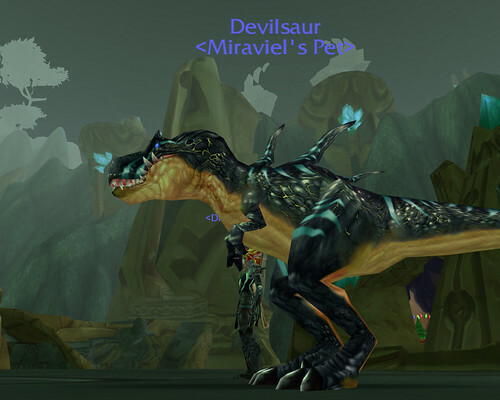 This is my new pet devilsaur (Level 71 Tyrantus named mob) stomping around with my hunter in WOW (World of Warcraft). It's TEH AWESUM! Its DPS (damage per second) is MAD! Yeah I guess if you're wondering where I have disappeared to in the past few days, it's there. I finally succumbed to the Wrath of the Lich King expansion. I really tried not to, given that WOW is such a time-sink and spare time is something I can ill afford these days. Oh well, my little Christmas time indulgence. Now, what shall I name this creature? LOL! That is a tasty name indeed! Playing on the T-rex pun too.